This site is mainly concerned with ham radio and electronics, but other stuff might sneak in. I was first licensed in 1956 as novice class WN7FLC in Fairfield, Montana. 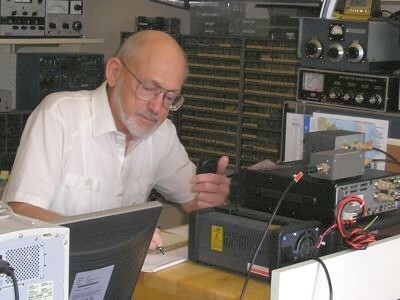 My first contact was with WN7FFG in Rigby, Idaho, on 80-meter CW. I became conditional class licensee W7FLC in 1957. I moved to California in 1963 into a forest of TV antennas at Vandenberg Village (near Lompoc) after graduating from Montana State University and accepting employment with Lockheed Missiles & Space Company. Earning a living and raising a family got in the way and I let my W7FLC license expire. I managed to keep in contact with the hobby by listening on the bands, maintaining my code speed, and writing a few technical articles for publication. I relicensed in 2004 as amateur extra class AE6PM after I retired from Lockheed Martin Missiles & Space Co. in Sunnyvale, California. I started with an ARC5 receiver and a homebuilt cw transmitter on the novice 80M band with homebuilt power supplies. My first commercial receiver was a RME-45. I have also owned and operated a Lettine 240, a Hallicrafters SX-96, a Heathkit Mowhawk, a Heathkit Apache, a Heathkit Cheyenne, a Heathkit SB-200, and Yaesu FT-840, FT-847, FT-857, FT-8900, FT-60R, VX-150 and the Kenwood TM-V71A. My first amateur radio antenna was an 80-meter dipole between two 35' poles on the farm near Fairfield, Montana. The 35' poles were made from one discarded power pole found in a ditch by the road, dragged home behind the tractor and then split lengthwise. A second 20' pole was purchased from the telephone company and cut in half and the 10' sections buried 6' into the ground formed the base of a 35' wooden tilt-up. The antenna was fed with 75 ohm twin lead. My antenna before that was about 120' made up of 3' pieces of strands of welding cable tied together after the insulation was burned off of the cable, stretched between the house and the granary. The house was 12' x 24' divided into two rooms. It was on a 12' x 24' basement of which I had half. Water was from a shallow well and the outhouse was about 100' to the rear, next to the coal/wood shed. Not exactly the "good old days" in my opinion. Water was good except when a mouse fell into the well or irrigation water muddied it. The outhouse wasn't a big hit when the temperature was minus 30 degrees F either. My first mobile station when I was in high school was a 10M transmitter and a 10M tunable BCB converter. The used equipment dealer that sold it to me neglected to mention that we were at the bottom of the sunspot cycle and there was no activity on 10M. Live and learn! My second mobile was a Lettine 240 transmitter and a homebrew BCB converter built from an article in Radio & TV News. The transmitter was in the trunk of my 1951 Chevrolet and I rigged up a windshield wiper motor so that I could tune it remotely. I finally graduated to a Heathkit Cheyenne transmitter and the same homebrew SW-to-BCB converter. The transmitter was powered by a PE103 dynamotor. The car engine almost stalled when the dynamotor started! My primary HF station today is a Yaesu FT-847 and Hy-Gain HT-18 vertical. The backup HF station is a Yaesu FT-840 and Heath SB-200 with the HT-18 vertical or a Hustler 40BTV vertical or a 40/20/10M dipole. My mobile station is a Yaesu FT-857 with either hamstick or Hustler antennas for HF and a Comet mag mount for VHF/UHF. My home station for VHF/UHF is a Yaesu FT-8900 and Kenwood TM-V71A with the FT-847 as a backup. Technology has changed over the years and I've kept up with some and let time pass by with others. I've always felt very fortunate that my hobby and my interest and my degree have always complemented each other. Member/officer/director in the Santa Clara County Amateur Radio Association, the Saratoga Amateur Radio Association, and the Silicon Valley Emergency Communications System. Also an active member of the Silicon Valley Volunteer Examiner Group and Communications Committee chairman for the Saratoga Community Emergency Response Team. ARRL Emergency Coordinator for the City of Saratoga.